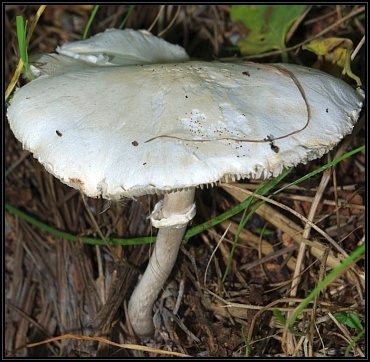 Description: Medium sized agaric, growing on soil amongst grasses. Pileus: Flat, white to cream coloured, dry, smooth, flesh white unchanging; 63mm diameter. Stipe: White browning towards the base, with easily detached sheating ring, centrally stuffed, bulbous at base, flesh white coloured darkening on cutting; 7mm diameter to 12mm 'bulb', 60mm height. Gills: Free, crowded, white, irregular margin. Pileipellis: Filamentous, irregular thin hyphae interwoven with larger hyphae. Gill Trama: Irregular, with inflated hyphae. 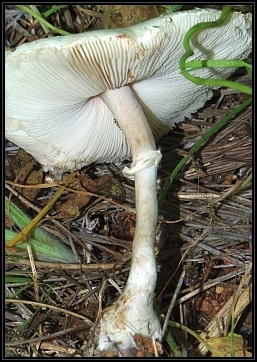 Ring filaments: No clamp connections seen; hyphae branching into 'Y' and occasional rounded hyphae (terminal). Spores: Ellipsoid, smooth with central oil drop, hyaline, with minute germ pore, dextrinoid; L=7.2-9.1µm; W=5.0-6.2µm; Q=1.28-1.53, Qm=1.43.